Another cherished childhood learning toy has been made into an iPhone app–this time, it is Fisher-Price’s Chatter Telephone, developed by IDEO. Toted around by many a toddler, now children ages 2 through 5 can now mash buttons on an iPhone instead of an unwieldy plastic toy. On the first screen, the telephone displays numbers like a regular phone. Each number tapped will be spoken and spun around like an old-fashioned rotary phone. Tapping the center (on the Fisher-Price logo) will take you to the music level. You can change the sounds from a piano to a recorder to a violin. In this level, the numbers change to letters, each of which correspond to a music note. Lastly, tapping the logo once more will take you to the community helpers level. Each button will have a face with a discerning object or symbol to illustrate what kind of person is on the button. Once a button is tapped, the person will “call” and state their name and occupation. On each level, all other objects, when tapped, will display a sound or movement (oftentimes both). For example, tapping the background will switch it between country and city scenery, and tapping the receiver will make it ring and dance. The Chatter Telephone has plenty going on: bright, vibrant colors, noticeable motions, and loud, clear noises. It is an app that is designed to grab the attention of your child, and keep it. Consequently, it is a great way for your child to begin learning numbers, phone etiquette, and musicality (but it might not be best for learning actual phone use). As an iPhone app upgrade, it is very well-crafted, but nothing beats banging away on a real telephone toy. 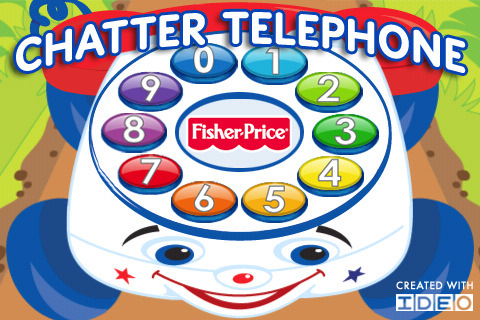 AppSafari review of Fisher-Price: Chatter Telephone was written by Julie Guan on April 6th, 2010 and categorized under App Store, Education, Fun, Games, Music. Page viewed 3981 times, 1 so far today. Need help on using these apps? Please read the Help Page.